In the world of the cheap metal storage shed there are many tricks that are used by manufactures to shave a few per cent off the price of a shed. It may be that some of these little tricks do not affect the use that you get out of your shed. were compromised to achieve this? Once a manufacturer has a design for a standard sort of metal shed then there are several marketing routes that they can take. One approach is to 'beef' the design up so that it becomes strong and resistant to potential thieves - they can charge some sort of premium for this so their can be a significant value added here. Another approach is to create some thing stylish for those that want something with a little 'je ne sais quoi'. We know from the world of designer clothes that a premium price can definitely be achieved here. Remember that the metal shed manufacturer is in the metal processing business. They are looking for a way to buy raw steel at one price and then sell it on at a higher price, after a bit of metal processing, in a more useful form. The approach we are going to consider here is what happens when the manufacturer decides that they are going after the cost conscious section of the market. 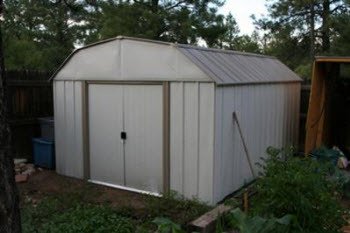 Cheap metal storage shed roofs are designed to withstand regular daily loads ..period. If there is heavy snow there is a good chance that the roof will collapse. During the winter months I get emails from visitors telling me that their shed roof has caved in. Often the emails are from people who live in areas that can be subject to heavy snow but not every year. The shed can perhaps survive several mild winters until a winter of extra heavy snow arrives and it is the straw that breaks the camels back. 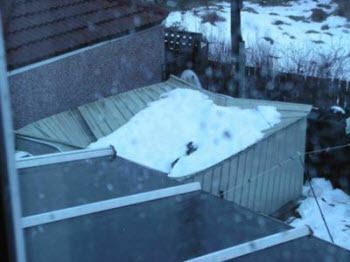 The standard response of the metal shed company to this situation is that the customer should have bought a snow loading kit and that would have prevented the problem. An alternative solution to this problem if you didn't buy/can't afford a roof kit is to insert a line of timber struts along the ridge of the shed in the autumn and then remove it in the spring when the snow has passed. Propping the roof along the centreline will typically make the roof about four times as strong. The props will make it a bit inconvenient to use the shed but then you don't go in there too much in the winter do you? 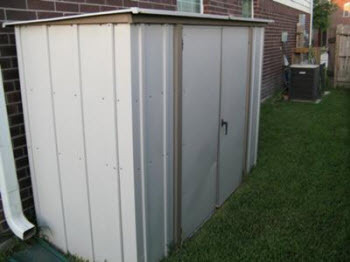 Another money saving wheeze is to make the cheap metal storage shed so that the average height person can just about stand up in the middle. When you get to the eaves of the shed most people have to stoop. This gives the consumer a bad back but it does save metal and metal equals cost. A possible solution to this one is to build a dwarf wall out of timber around the perimeter of the shed to give you the extra height that you need. Use a 3x2" timber as the top and bottom plate and then vertical studs at 600mm centres along the walls with ½" ASX ply. This way your cheap metal storage shed will have much more room height and you will be able to move around without bumping your head. Many people have a flat level place that they had a shed previously so this one is one of the more understandable things to leave out. However if you are building a cheap metal storage shed you need to realise that the accuracy of base will have a big influence on how easy it is to build the shed. If the base of the shed is not level it will be very difficult to get the holes of the metal frame work to line up. I occasionally get emails about readers having difficulty with this issue. Normally it turns out that it is an issue with the accuracy of the base construction. To be fair to the metal shed manufacturers the sheds and their frames are usually made using highly accurate jigs and so any error is not usually of their making. The most economic option here is to make your own shed floor. I wrote an article on it here and it really is the best way to get a good flat surface to build your metal shed on. Having the surface perfectly flat is critical to getting the holes to line up. OK you might have a flat level area on which to build your metal shed. When it arrives and doesn't have an integral floor so you just build the shed directly off the concrete. A few months later you might notice that water is leaking in between the bottom of the shed wall. You also might notice that the walls or the roof of the shed have a large amount of water on them. The shed floor is an important part of the shed structure. It lifts the items that are stored up off the ground and allows water that runs down the walls to reach the ground and run away. The floor also acts as a barrier to moisture from the ground evaporating into the shed and causing damp problems. This article on condensation in metal sheds goes into a lot more detail on this problem and solutions to it. Finally the quality of the doors are a good reflection on the overall quality of the shed. The shed cladding and framework are easy to design. One tricky bit when designing a cheap metal storage shed is the door. How secure should it be? In some parts of the world a shed does not need to be very secure, just a couple of loops so that the doors do not blow open in a high wind. Is the case where you live? It isn't where I am from. In most places the neighbourhood police force recommend that you make your shed as secure as possible to protect the sheds contents from casual thieves. And this recommendation holds good even for sheds in enclosed gardens. When you are buying a cheap metal storage shed give the doors a close inspection from the point of view of a potential thief. There are suppliers out there who used many different methods to make sure that their cheap metal storage shed really is the cheapest on the market. However when you buy your shed you will be aware of some of these methods. It may be that some of the features that the manufacturer has economised on are not important to you, in which case you may snag a bargain. It may be, for example, that paying just a little bit more to avoid a shed that has weak or badly operating doors for example will be a good measure to take.